As a site, I think it’s fair to say we like the Transcontinental race, it’s a bonkers race for sure, stretching over 4,000km across Europe, from the cobbles of Flanders where the race starts on the Muur in Geraardsbergen, through the Balkans to the sizzling heat of Turkey and the Asian border. Oh, and apart from 4 mandatory check points, you get to choose your own route. All the while with no outside support, so that’s no follow car, no soigneur to fill bottles, and certainly no DS offering tactics or advice without suffering from sleep deprivation. You are on your own. Genius. Last years race didn’t go well for me, multiple punctures saw me take 36 hours just to get to Paris, and from then on it didn’t go as well as I’d planned (check it out here). So this year a few things had been changed - tyres had been swapped to Schwalbe Tubeless Ones in 28mm (Reviewed here) and they coped eminently well - the one issue I had was from a big glass patch in Bosnia which damaged the tyre too much for the sealant, however I put my spare inner tube in and was away again. The next day I got the tire itself repaired at a roadside Vulcanizer where they inserted a small patch and then heated and pressed the patch into the rubber - it was very cool! Not everyone suffered punctures, but a great many did, the 40km of rocky roads over the alps were the bane of many riders race, with pinch punctures causing no end of grief – I flew down the hills, and didn’t sustain any troubles at all – after this experience, I cant see myself going back to tubes again! I’d done some decent miles in the latter part of the spring and early summer, unfortunately my winter and early spring were written off by a broken collarbone and rib, making riding not possible for 2 months. Whilst this wasn’t ideal I still managed a 900km ride two weeks before the race, allowing me to test both my legs and my kit, with everything coming out well. The previous year I’d forgone a ground mat for sleeping, just using bubble wrap and space-blanket as a mattress - that was a crap idea - so this year I went with an Alpkit Numo mat - great bit of kit which did a much better job of keeping me warm at nights. Honestly though I’m not decided on whether it was a good idea or not, an inflatable mat adds 15 minutes to a sleep break, and the act of blowing I found had the effect of waking me up - so perhaps it’s better (in a RACE) to forego the inflatable and go for closed cell, or nothing at all - and just toughen up for the few nights you need it before the nights warm up? The other big change, apart from riding a WyndyMilla this year (lovingly painted by myself) was the move to Shimano’s Hydraulic braking, this was paired-up to Ultegra Di2 for precision, no faff, and because pressing a button several thousand times is a darn sight easier and less fatiguing than moving an STI lever - I also realised that due to my baggage placement this year (in front of the handlebars) I wouldn’t have been able to shift anyway, so Di2 came in as a necessity with this configuration anyway. Hydraulic discs = my new favourite thing! A fully loaded race bike and rider weighs a great deal, figure the best part of 95 - 100kg with food and water. Stopping that in the wet can be problematic on rim brakes, but I never had any issues with discs in the wet, and it rained a great deal the first couple of days. I found they also give a stronger sense of confidence, they definitely helped on the rocky descent of the Col della Assietta in Italy - picture a mountain bike track, descending off a mountain, on a road bike - although, again with hindsight, they also allowed me to take much bigger risks on the descent than prudence would suggest, I was very much at my technical limit - but the brakes brought me back with ease! And I’d better not go into too much detail, but slipstreaming trucks at 50km - it’s good to know that your stopping powers are better than the trucks…. In 2014 I’d carried a full set of spare clothing for riding and also normal clothing, lessons had been learned for this year! As far as additional clothing was concerned I had a spare set of riding gloves, merino knee and arm warmers for the cold, and a small beanie for sleeping - to be paired up to a Vulpine thermal gilet as it is super warm and super packable. For race attire I went with a Rapha Aerosuit (Reviewed here) (in the black and white data pattern) the rationale being that the lack of straps would be comfortable on a recovering collarbone (which it was!) and if it could offer any aero advantages then I’d happily take it. It can seem odd to be thinking about saving a few watts over thousands of km’s but this is exactly the type of event where marginal gains kick in - for example; an average of 5 minutes per hour off the bike adds up to 2 hours per day, which over the race length can add a full day to your ride! So efficiency savings are certainly the way to go! The aerosuit was indeed a good choice, combining lightweight, ventilation, and performance - very much recommended! I really liked Josh Ibbott’s luggage system, carrying it all within a frame bag, but he’s about 6” taller than me, so his frame was way bigger and allowed for it. 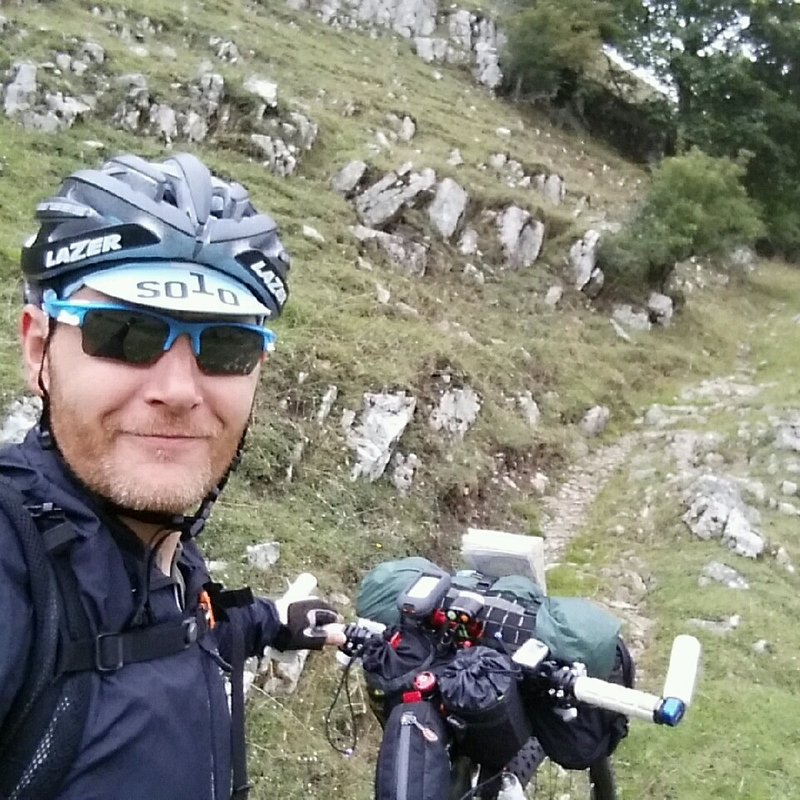 I used a combination of Alpkit luggage and a new mini-sized frame bag from Restrap - other than a smaller (or non-existent) sleeping mat I’m not really sure how I could have taken much less stuff, so for me this system worked really well - and it was great to be able to support two smaller Uk firms! The race itself started at midnight from the Muur, and the day prior was spent travelling from Lille (where I’d lost the best part of a night’s sleep in a losing battle with a mosquito), checking in and preparing for departure - which effectively meant eating and drinking loads - which was handy as it seems those Belgians know how to cook! There was masses of waiting, either soaking up the atmosphere or getting more anxious about the coming night. There was a lot of checking out each others bike - having your twitter tag on the bike seemed to have paid off as a name badge, with several people recognising my bike and name from this site. As we all assembled on the Muur at 23.30 the tension was evident, although the mood was happy there was clearly a lot of thought being given to the hours and days ahead, with doubts over bike, kit and self showing on many faces - for most of us, it was a trip in to the great unknown. The Major of Geraardsbergen gave a speech, torches were lit, the drums were rolled and we were off! Great read, Martin. Looking forward to the next instalment! A suggestion for a sleeping mat is to check out the Klymit range they have some really innovitive mats which can be inflated in less than 20 blows, they also make some of lightest minimalist one's on the market too. Josh Kato won the Tour Divide this year whilst using one of their mats. sorry cycleofaddiction, perhaps I wasn't very clear on this bit. The Num didn't take 15 minutes to blow up, in fact it took about 1, but it is the process of unpacking, finding safe ground to place, blowing, emptying, folding, and repacking that adds the time - most of which would be trimmed off by a foam mat. Also, i did look at the Klymit (and it does look like a good bit of kit) but it is far more expensive than the alpkit option! Followed your progress on Twitter so I am looking forward to the future instalments of this blog. Live Long (Tyres) and Prosper.